I have pound cake tips and secrets for preparing and baking a PERFECT pound cake every time. Learn how to guarantee moistness. More homemade pound cake recipes including various flavors at the end of the page. Let's get baking. These tips come from Dorie Greenspan's cookbook: "Baking - From My Home to Yours." 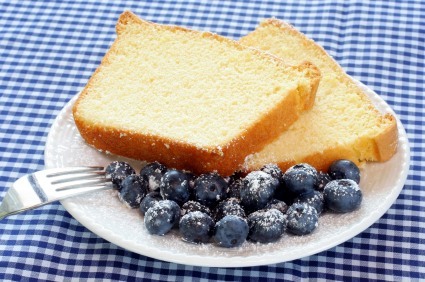 Pound cake is a baker's basic, whether served plain or as the base for an ice cream sundae or juicy berries. It can even be toasted and buttered when all that remains is an inch or two of a slightly stale loaf. Pound cake gets its name from the proportions in the classic recipe; a pound of butter, a pound of flour, a pound of sugar and a pound of eggs. Pound cake's primary flavor comes from butter. For this reason you should try to use the best butter you can when you're baking a pound cake. Here's another pound cake tip: you must take the time to let the ingredients warm to room temperature and mix the batter properly. This is an important pound cake tip: In order to get the fine-grained texture that is the hallmark of a pound cake, have all the ingredients at room temperature. Because there is only a touch of baking powder in the recipe, the cake rises primarily on egg power. It's the air that is beaten into the eggs that gives the cake its lift, and warm eggs beat to greater volume than chilled ones do. The butter must be at room temperature, but it shouldn't be so soft that it is oily and shapeless. While you can mix pound cake batter by hand, a mixer is the tool of choice because you want to blend the butter and sugar as thoroughly as possible. Don't skimp on the beating time - give the butter and sugar a good 5 minute beat, and you will be awarded with the characteristic fine crumb. Add the eggs, one at a time, and give each egg a two minute beat after each addition. Once the last egg goes into the mixing bowl, the beating is over. The next step is to blend the flour into the batter, and this has to be done gently. You can do it with a mixer, keeping the speed on the lowest setting, or you can incorporate the flour by hand, folding it into the batter with a sturdy rubber spatula. Either way, the mixing time should be short - as soon as the flour disappears, stop. Another one of my pound cake tips (secret): Because pound cake needs a long bake in a moderate oven, I like to put the cake on an insulated baking sheet, or on two stacked regular baking sheets - the insulation keeps the bottom of the cake from baking too quickly and from getting too brown. Keep an eye on the loaf as it bakes because the top can get dark well before the loaf is baked through. If that's the case, cover the cake loosely with a foil tent. My pound cake tip: After the cake has been in the oven for 10 minutes and the top has developed the slightest, lightest start of a crust, dip a dough scraper in melted butter and plunge the scraper lengthwise into the center of the cake. This will encourage the cake to form its crack along the scraper's straight line. This is an old family recipe and turn out a cake with the fresh-from-the-farm flavor of butter and eggs. It is moist and has a soft crust that cuts beautifully whether you are slicing it thick (so it can be a base for ice cream or syrupy fruits) or thin (to serve it plain or with a little jam). Another pound cake tip: The cake can be made with all-purpose flour or cake flour. If you use cake flour the crumb will be even more delicate and just a touch more tender. As with many butter-rich cakes, this one is not just a good keeper, it actually improves with time. Let the cake cool completely, wrap it tightly in plastic wrap and leave it on the counter overnight. PREHEAT oven to 325 degrees and butter a loaf pan. Put the pan on a insulated baking sheet or two regular baking sheets stacked one on top of the other. Mix the flour, baking powder and salt together and set aside. Beat the butter and sugar on high speed for a full 5 minutes. Reduce the speed to medium and add the eggs, one at a time, and beat for a full 2 minutes after each addition. Mix in the vanilla and reduce the speed to the lowest setting you have to mix flour mixture in until it is incorporated - don't over mix. In fact, you might want to fold in the last of the flour (or all of it) by hand with a rubber spatula. Scrape into the prepared baking pan and smooth the top. Check the cake after 45 minutes. If it is browning too quickly, cover it loosely with a foil tent. If you are using a 9x5 inch loaf pan, you'll need to bake the cake for 70-75 minutes; the smaller loaf pan needs 90 minutes. The cake is properly baked with a thin knife inserted deep into the center comes out clean. Remove from the oven and transfer to a rack and cool for 30 minutes. Run a blunt knife between the cake and the sides of the pan and turn the cake out, then turn it right-side-up on the rack and cool to room temperature. You may add vanilla or almond extract to the batter (1/2 teaspoon will do) or rub the grated zest of 1 lemon or 1/2 orange into the sugar before you beat the sugar with the butter. With my pound cake tips and recipe - you will have the perfect pound cake. Congratulations.